Villa of 100 m2 on two floors with 700 m2 garden on several levels. The garden is lush with mature olive trees, cherry trees and flowers. There are several terraces both sunny and shady nooks total of 165 m2 with private pool (7,5 x4 m) and panoramic views. Deck chairs, dining tables, chairs and outdoor weber kitchen with gas grill on the patio. The covered pergola on one of the undisturbed terraces operates throughout the summer as additional ' conservatory ', where also the outdoor kitchen is located. The villa is built on a slope and faces south with magnificent views of the valley and mountains. The house sits on top of the small, charming town Bendejun in altitude of approx. 500 meters. When you see the incredible views from the house you can feel calm and 'hear' the silence. Upper floor: bedroom, separate bathroom and toilet, large living room with fireplace, satellite TV, free wifi and access to a 100 m2 terrace with pool. Modern kitchen with dishwasher. Outdoor weber kitchen with gas grill on the patio. Panoramic views from every room as well as from all over the terrace. Panoramic views from every room as well as from all over the terrace. Separate ground floor: 2 bedrooms, newly renovated bathroom with eg washing machine. Exit to own 65 m2 terrace. There is no interior staircase between floors, but a wide, easy external staircase. The house is particularly suitable for a family with older children or more adults . On the fhe first floor bathroom and toilet are seperated. The bathroom on the lower floor is with washing machine and toilet. The kitchen has a dishwasher, fridge / freezer, convection oven, extractor fan. And a magnificent view of mountains and valley. From the kitchen is entrance to the living room and access to the terrace. Kitchen terrace is secluded and has stunning views over the surrounding countryside. There are doors into the pool area. The pool is 4x7,5 m, 120 cm deep at one end with a wide tile staircase, 180 cm in the other. The pool is fenced according to French law. The terrace is 100 m2 around the house, so there is ample space for sun loungers and tables. On the same level, but at the other end of the terrace, the outdoor kitchen is adjacent to a lovely, covered pergola. Our pool man comes every week to clean the pool and sweep the area around it. The pool is open from 15 May to 1 October. The house is located in the hinterland of Nice area approx. 500 meters above sea level on top of the small town Bendejun. There is private parking and a private pool on the grounds. Bendejun is a small town with approx. 800 inhabitants. 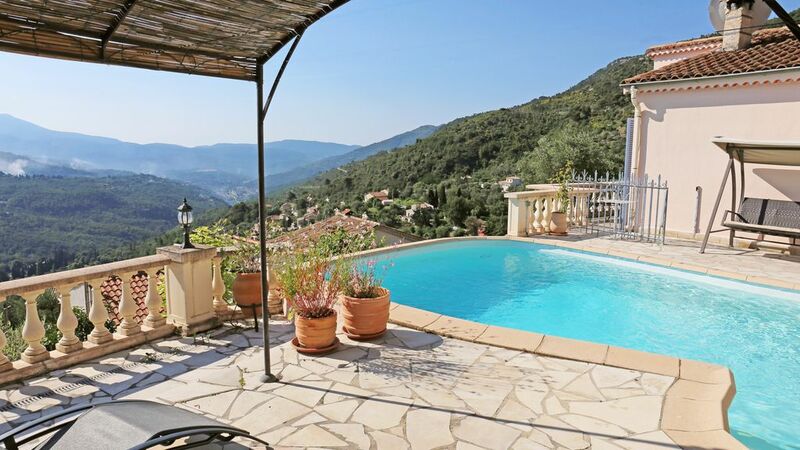 It is 24 km from the center of Nice, the Mediterranean and the airport with approx. half an hours drive. The town's only business (2.9 km from the house) is a small grocery store where you can get daily necessities such as ham, cheese and fresh baguette and croissants. There is also a small restaurant for lunch with local specialties. There are several shops in Contes, 7 km from the house. Here are two good bakers, Casino grocery, butcher, greengrocer, several restaurants and a small, cozy bar. Supermarket Intermarché is found in La Pointe, 11 km from the house, and a little further inland from Nice to La Trinite there is a huge Auchan supermarket in a shopping center where you can get everything the heart desires of food and wine, clothing and shoes, etc. La Trinite is a large suburb of Nice.